Christopher Zinn writes about his return to Aceh with APJC in 2014, nine years after his first visit. The official Aceh tsunami 10th commemoration singles out just three words to try and give some meaning to the loss of 166,000 of its citizens: reflection, appreciation and awakening. There will be varied interpretations and feelings around such an event for those involved be they victims, NGOs who aimed to “build back better”, donors particularly from Australia and so many orphans. And returning to this poor Indonesian province after almost ten years away made these words resonate particularly personally around issues with the fall out and recovery from the great wave. Of the 500,000 homeless beset with unbearable agony, grief and anger at this random geological event, we then met two people and tried to make a small difference. Amidst the unprecedented level of public donations via agencies large and small to get Aceh back on its feet we wondered what might be achieved by giving direct to the remnants of just one family. We raised almost $10,000, a fortune in Indonesian terms then and now, and gave it all to a couple we had first met by the side of the road. What had happened to Umar Ali and Rusnah? Was the “give direct” campaign justified and what did it achieve? And after all these years would we be able to find them? The story begins a few months after the devastation when 10 of us on an Asia Pacific Journalism Centre fellowship were in Aceh to report on the recovery. We’d stopped because of a ragged Indonesian flag fixed alongside a tarpaulin-covered tent and I wanted to get some pictures. We spent no longer than 15 minutes. We’d interviewed many survivors and in this context Umar Ali and Rusnah’s story was perversely unremarkable. Their house had been torn apart, their two daughters swept away before them and they had nothing but each other left. No photos of their children or even their bodies. Their textile and tailoring business and other family members all gone. Yet Umar Ali in his yellow t-shirt and Rusnah’s smile and concern for our wellbeing in this trying place were hard to get out of my mind. Good job we got their email address. As a journalist I had been to trouble spots before and published peoples’ stories in the vague hope the publicity might in some way and in some time eventually bring some benefit to them. The anti-Marcos riots in early-1980s Manila, another tsunami in PNG in 1998, the east Timor crisis in 1999 – all had possible candidates but it was too hard to do anything meaningful. Here, perhaps, on a dusty road in Aceh was a chance. Educated people who could re-establish a business and employ others and with the right story and photo to elicit compassion and donations. On return to Australia and with others we started a “give direct” campaign to help out Umar Ali and Rusnah with 100 percent of donations going straight to them. We didn’t need too much. Was it fair when there were so many other deserving causes and experts in aid on the ground already to intervene in this way? Perhaps not, but it was at least something, one little way we could connect with what was left of an otherwise ordinary family. An interview on RN’s Life Matters brought in $1,000 from one listener moved by their plight and the chance to bypass charities. A City to Surf fundraiser and other efforts raised almost $10,000. Then came the issue of how to securely deliver the funds. Fortunately I got a job making some recovery videos one-year-on for the reconstruction agency in Aceh and was able to meet the couple again in December 2005 and give them the money. Since then I left mainstream journalism and contact grew sporadic, and then the email address failed to reply. I was confident they would have made a go of it and parked my concern. Then came a call from the Asia Pacific Journalism Centre inviting us back for the tenth anniversary. 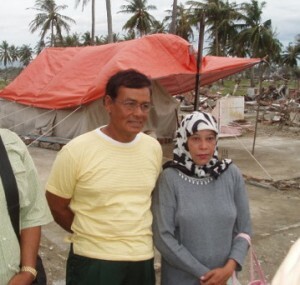 In December three of the original 10 from the 2005 visit were back in Aceh witnessing the resilience of the locals; the widespread reconstruction and the preparations to mitigate the effects of any other tsunami. With only their names but no address, there seemed little hope of ever finding the couple again. At a meeting with some younger journalists, who the APJC exists to train, I sought advice. One offered to put their picture and my request on Facebook. In five minutes we had a number. In three days we were together. laid out for our group, including fixer Hotli. It was an emotional reunion. Umar is 58 and has been unwell but we learned the money had set them and their business up for the future. They had been given a simple NGO-built house where they used to live but Rusnah cried too much with all the memories so they moved to another area. They have few pictures but one on their wall is when our larger 2005 group met them outside their tent. Much has changed for them since then and for Aceh, and there is widespread appreciation of how the generosity of others made so much possible for all of them. Umar Ali and Rusnah made me promise to come with my family and stay with them when next in Aceh. Until this happens, I will continue at a distance to be affected by this couple and the whole Aceh experience, and encouraged to make my own reflection, appreciation and perhaps even awakening. This Boxing Day I shall think of them fondly and wish them strength. Dec 26 is the day each year that they go down to the Ulee Lheue mass grave, where they believe their daughters are interred along with 16,000 others, and they pray. A version of this article can be found here.